The Steering Committee guides the topical focus of MEP-Directed research annually. The research agenda is designed and carried out by MEP Directors, staff, and student researchers. Throughout the year, MEP-Directed research engages in a series of related and thematically aligned research questions. This structure allows for MEP-Directed research to be focused on problems of practice that are pressing for the District and of current interest for the academic community. Research focus areas must be mutually beneficial to the District and University for MEP to engage. 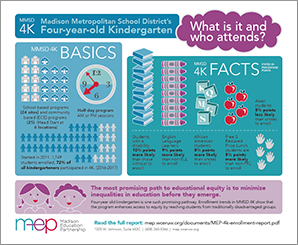 The focus of MEP-Directed work from 2016-2018 was MMSD’s four-year-old Kindergarten (4K) program. MEP approached this research with an equity lens given the widely demonstrated potential for educational interventions prior to Kindergarten to enhance academic success of children who have historically been at greater risk of experiencing academic challenges. MEP is now focused on examining student attendance in 5th – 9th grade. MEP kicked off the latest directed work by creating a MMSD Design Team that includes central office and school based leaders involved in middle school attendance. By utilizing a co-ownership approach to examine research production, the design team will be engaged in each step of the work, including crafting research questions, exploring research design options, and examining how study outcomes can guide policy and practice changes. Initial research questions are listed below. In 2018-2019 MEP has shifted its focus on student attendance in 6-9th grade. How is school climate related to student attendance and what is the relationship between school attendance, school climate, and academic achievement? To what extent do attendance patterns in grades 6-9 reflect attendance patterns in elementary school? What predicts which students experience increases in attendance and which students experience declines in attendance in middle school? What is the relationship between behavior metrics (e.g., discipline referrals, suspension/expulsion) and attendance? The logic of focusing on attendance seems straightforward and compelling. Students need to be in school to learn; if students do not come to school, teachers, administrators and support staff cannot do their jobs. How prevalent are excused and unexcused absences in early elementary school? How are student and family background characteristics related to the number and type of absences students’ experience? How are excused and unexcused absences in early elementary school related to academic and socioemotional outcomes? To what extent do differences in school attendance contribute to racial/ethnic and economic inequalities in academic achievement among children in Grade 3 and younger? Who participates in MMSD’s 4K program? Although MMSD provides universal access to a part-day 4K-program, opting-in to enroll is not universal. An important first question is how does enrollment in 4K differ among different groups of children? Are students’ background and family characteristics associated with patterns of attendance? For example, are children of color or low-income children more or less likely to attend 4K than other children? Does home language predict attendance? Finally, do program elements (such as time of day or type of school) influence enrollment? How is participation in 4K associated with school readiness? How does this association vary by child and family attributes? What is the association between 4K participation and the academic and social and behavioral competencies of children entering Kindergarten? How if at all does this association vary by race/ethnicity, parental education or free and reduced-price lunch eligibility? How, if at all, does this association vary across 4K sites?